Shiva Parvati Temple is small temple with immense intricate work on every inch of the wall covering it, with the famous white image of lord Shiva and goddess Parvati out looking of the upstairs window. 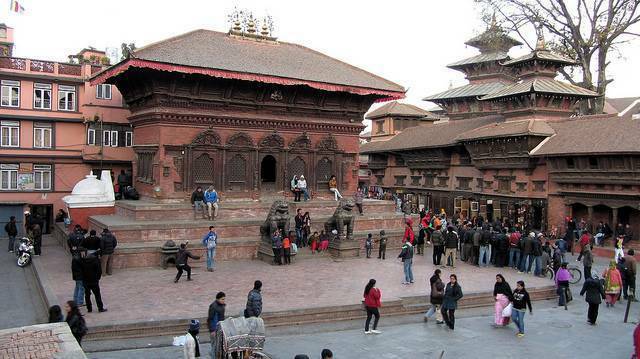 A temple built in the 1700’s towards the beginning of the durbar, a combination of the modern and the traditional. The Shiva Parvati temple stands tall and undisturbed by the modern day apartment’s right behind it, both structures and lifestyles existing peacefully. Also known as Asta Yogini and build by Bhadur Shah, the statues of the deities looking out of the window, is a way of depicting the great gods keeping an eye on the valley. The structure rests on a two stage platforms believed to be an open dancing stage hundreds of years earlier.